Fishing Hurts? Hurts Who? – Pennsylvania: Hunt. Fish. Shoot. Home › Fishing › Fishing Hurts? Hurts Who? Did you see this on Fox News? 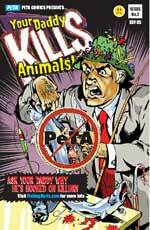 PETA is actually handing out comic books to 12 year olds telling them their fathers are evil because they fish. Trust me, don’t actually click on that link…you will only give them more traffic and it will make you want to wrap your head in duct tape to protect it from exploding. This site may be more palatable.